Destin West condo, beach resort home in Destin. You'll feel it the first time you summit the spiral staircase to your private rooftop terrace: It's the highest point on Okaloosa Island, and from here you'll have a 360º panoramic view of the island, Choctawhatchee Bay, and the Gulf of Mexico, not to mention untouched beaches and heaping sand dunes. You read that right: unobstructed island, bay, beach and ocean views that stretch north to south, east to west. Spiral back down to the main living quarters, where the views just don't quit. Unlike many lower-level condos, Pelican's Perch offers open water views from the master bedroom, living room, dining area, and kitchen, plus peekaboo views from the second bedroom and bunkroom.This is a soothing and special getaway, where you can enjoy your morning coffee on the balcony before the kids get up. A place where you can lounge on your private rooftop. A getaway where you can watch the sunset dip over the horizon, the skyline streaked in a kaleidoscope of pink and purple, as your fresh Gulf shrimp skewers sizzle away on the grill. The resort's list of amenities is almost embarrassing, with offerings like a 5,000 square-foot swimming pool, kid-friendly zero-entry (aka beach) pool, two giant Jacuzzis, winter-heated waterfall pool, and the region's largest lazy river. Yes, without a doubt, Destin West Resort is one of the most family-friendly, well serviced, and upscale locales on the island. 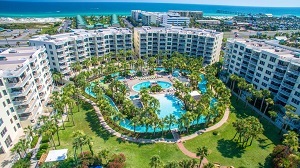 Destin West Condo Rental in destin FL..